07 Montana 3500 plastic slide out cable and gas hose support breaking on outside connection. 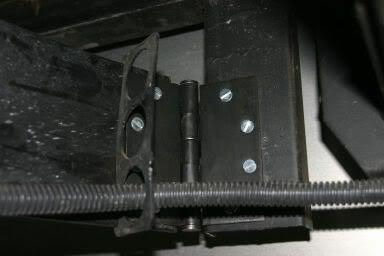 Inside connection has a post with swivel connection and is not stressed like the outside connection which is hard connected causing the support to flex. What is a good fix or replacement for these poorly designed guides? I searched and did not find any other threads on this subject. Currently I plan to make a reconnection joint using a piece of rubber conveyor belt. I don't know how handy you are, but many of us have cut the plastic where it broked and added metal hinges. I've done this to all three slides that have had this problem. The hinges easily satisfy the bends at the places where the plastic was known to break and I've had no problems anywhere since. Here's a photo of what I did. I used a 4 inch hinge, machine screws and nuts, and some washers (on the back sides). If you'd like more details on how to do this PM me or send me an email. If you are in a hurry drill 2or3 matching holes in each side of the broke pc and use 2or3 nylon tie wraps to make a hinge I did mine 4 yrs ago been meaning to put steel hinges on it since. But if it ain't broke don't fix it!! I did the door hinge repair 5 years ago on my slides and it is still holding up. George, my money is on the conveyor belt! Just finished installing conveyor belt hinges on three slides. Used 5"High x 8" long x 1/4" thick conveyor belt. Used existing self taping screws on slide wall and drilled holes in belt and support and fastened with 4 wire ties on each hinge. I will evaluate this fix and if it dosn't work I'll go with the 4" hinges. Thanks all for the comments and I will let you know how it turns out.